How might other South China Sea claimants responds to China’s maritime strategy? China released its first white paper on military strategy at the end of last month. Issued by the State Council Information Office, the white paper outlines China’s strategy of “active defense,” and highlights four critical security domains: the ocean, outer space, cyberspace, and nuclear forces. For the states of Southeast Asia, China’s outlined military strategy for the ocean is going to be of particular interest, and is likely to elicit much concern. A number of regional states have been engaged in maritime territorial disputes with China. 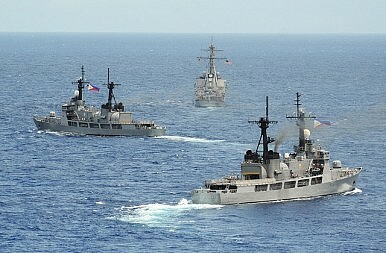 In recent years, China has become more assertive in its claims that the whole South China Sea falls under its control. China’s white paper will have a number of implications for these regional states, and for the Association of Southeast Asian Nations (ASEAN), which to date has had little success in bringing an end to the maritime conflict. With ASEAN essentially moribund, the states of Southeast Asia will increasingly engage in both internal and external balancing to counter the Chinese threat. This will manifest itself in increased regional defense spending, and enhanced security commitments with external powers. China’s white paper has a number of implications for Southeast Asia. The Philippines, Vietnam, Malaysia, and Brunei all have overlapping maritime territorial claims with China. Whilst these states are likely to display the most concern following the release of China’s white paper, the report has implications for the security of the region as a whole. According to a recent defense spending report, annual defense spending in Southeast Asia is projected to reach $52 billion by 2020, from an expected $42 billion in 2015. The Southeast Asian states were expected to spend $58 billion on military hardware over the next five years, much of which is expected to cover naval procurement. However, as a collection of small states, it is unlikely these enhanced military capabilities will do much to deter China. While internal balancing as a response to the Chinese threat is to be expected, this will carry little weight unless combined with external balancing. We can therefore expect to see an increase in security cooperation with external powers, specifically the United States. The Philippines and the U.S. signed an Enhanced Defense Cooperation Agreement in April 2014. However, China’s increasingly assertive actions in the South China Sea have caused the Philippines Defence Minister to call for a “stronger commitment” from the U.S. with respect to maritime security. Vietnam does not currently have any defense agreements with the U.S., but this may be something Hanoi will seek to rectify in the coming months. Instead, Vietnam has sought closer security ties with regional powers. A deal to consult on defense affairs was concluded with Australia in March 2015. Similarly, Japan has sought to expand its security ties in Southeast Asia. Japan signed a defense pact with Indonesia in March 2015; following enhanced military partnerships with the Philippines and Vietnam. This counter-balance to China is vital to the security of Southeast Asia. Regional institutions, such as ASEAN or the ASEAN Regional Forum (ARF), have proven incapable of regional conflict resolution. Rather than providing a multilateral response to the conflict, China has succeeded in dividing ASEAN on the topic of the South China Sea. China refuses to deal with the issue on a multilateral basis, preferring to deal with those states involved bilaterally. As the recent Rohingya migrant crisis has shown, ASEAN is largely incapable of responding to regional conflicts, despite its professed norm of providing a regional solution to regional problems. As China advances its muscular policy in the South China Sea, we can instead expect regional states to resort to classic balance of power politics to protect their security and territorial integrity. Laura Southgate is a third year PhD student studying International Relations of Southeast Asia at the University of Otago, New Zealand. Who Owns What in the South China Sea?It’s Time for a New Philippine Strategy Toward ChinaIn Philippines, Pompeo Offers Major Alliance Assurance on South China SeaWhat’s in the Japan-Philippines Maritime Patrol Near the South China Sea?APEC 2017: What Did Vietnam Achieve?